Which video editing software you will use to edit your videos depends on a number of factors, but one thing is for certain, video enthusiasts have almost no need for professional editing software like Premiere Pro or Final Cut Pro. Most people just want to polish the footage they captured with their Smartphones and share it online, and luckily there are plenty of editing programs that provide just that. The latest update of the iMovie 10 and Adobe Premiere Elements 15 are among the very best consumer-level editing programs currently available on the market, so we decided to compare them in order to provide you with the information you need to decide which software best serves your needs. As one of the best video editing software, Filmora video editor is available on both Windows and Mac systems. It has an intuitive interface which allows you to manipulate and edit a video quickly. With Filmora, you can do some basic video editing operations such as trimming, cutting and rotating as well as some advanced features such as Chroma keying, video stabilization, audio mixing and equalizing and color grading. To empower your stories, Filmora also provides some quick-to-use filters, overlays, and transitions. You can add some royalty free sound from the Music library and add text and titles to the video with some animation effects. Check the video below to learn more about Filmora video editor. Video enthusiasts need an easy-to-use video editing software that enables them to access all the tools and effects they need in just a few clicks, and although both iMovie and Premiere Elements are remarkably easy to use, the question remains which one is better for an average video editing software user? iMovie is now a free app for Mac and iOS users, but if you are using an old Mac which was purchased before 2014, then you will need to pay $14.99 to update to the latest iMovie version. For users who have purchased Mac which was produced after 2014, all updates of the software, including the latest iMovie 10 are completely free and you can download them from the AppStore. However, you will need the Mac OS 10.12.2 or a later version of the Mac's OS if you'd like to run the iMovie's latest update seamlessly on your Mac. Unlike the iMovie, Premiere Elements 15 can be used on both PCs and Macs, but you will need Mac OS 10.12 -10.14 while the Adobe's editing software is compatible with Windows 7,8 or 10. However, Premiere Elements 15 comes at the price of $99, which makes it a little less attractive option than iMovie, from a financial standpoint, at least. For updating to the latest version, you will also need to pay $79.99. Premiere Elements 15 was specifically designed to meet the needs of inexperienced video editors and to provide them with tools to learn the video editing craft if they want to. For that reason, the software's interface is incredibly well organized, with Quick, Guided and Expert modes that provide the user with basic and advanced editing options. Premiere Elements 15 is suitable for even completely inexperienced video editors that have no previous knowledge of this editing software. 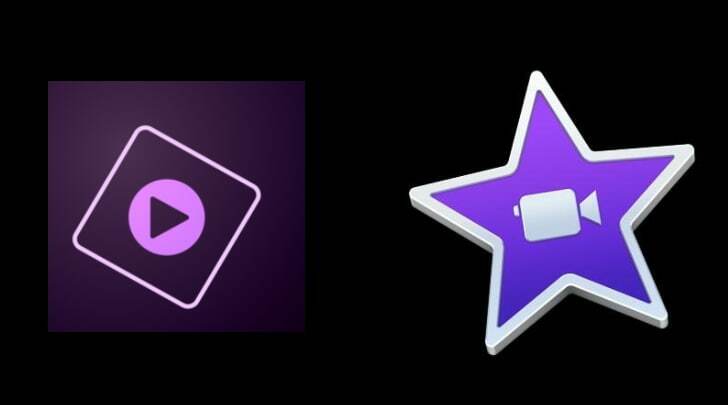 When it comes to the software's layout and interface Premiere Elements 15 and iMovie 10 aren't easy to compare since Apple's editing software, although remarkably simple to use isn't as nearly well-organized as Premiere Elements. Furthermore, it may take you some time before you learn your way around iMovie 10, and if you are looking for a simple and well-organized video editor you're probably better off using Premiere Elements 15. Despite its somewhat messy interface, iMovie 10 is still a powerful video editor that enables you to produce stunning HD and 4K movies captured with ultra HD cameras, GoPros and latest versions of iPhone. The Apple's video editing software provides a number of useful video effects such as Picture-in-Picture', 'Ken Burns effect' or 'Image Stabilization' to name just a few. Furthermore, iMovie 10 offers a plethora of sound effects and it also enables its users to narrate their videos in their own voice as well as utilize songs from the iTunes library. On the other hand, Premiere Elements 15 offers its users powerful editing tools, such as 'Haze Removal' that enables them to enhance the footage they are editing. What's more, the Adobe's video editing software allows its users to organize the footage faster, effortlessly remove parts of the video clips and intensify the colors in their videos with only a few clicks. Premiere Elements 15's Elements Organizer feature makes sharing videos on YouTube, Vimeo or Facebook a simple process. Why should You use iMovie? 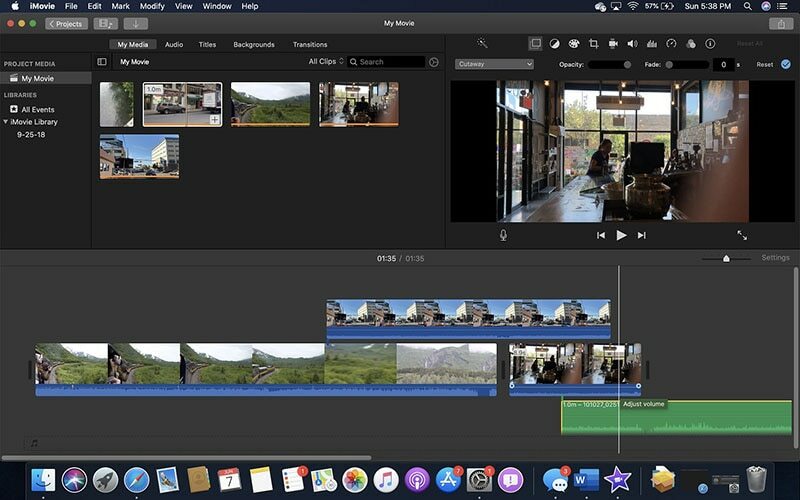 Mac users who don't need professional editing software like Final Cut Pro will certainly benefit from iMovie 10 because it offers more than enough video editing options for video enthusiasts who want to create amazing visual material without investing too much effort in it. The support for the latest video formats and a large number of different video and sound effects guarantees that users of the iMovie's latest update will be able to perform all the editing tasks required for the production of a well-polished video. Why should You use Premiere Elements 15? Premiere Elements 15 is perfectly suited for video enthusiasts who would like to start learning about video editing process from the ground up. The suite, which contains both Premiere and Photoshop Elements 15 can be purchased for $119,99 and it is a perfect solution for users who'd like to edit both photos and videos. The newly added effects and editing tools increase the potential of the Adobe's video editing software, but some users might consider it expensive given the fact that there are much more affordable editing programs on the market. Although more expensive and somewhat more complex Adobe Premiere Elements is a much better choice for users who want to learn how to edit. The software enables its users to produce videos quickly, but those who want to perform more demanding editing tasks have all the tools they need in order to do so. While iMovie is certainly an excellent choice for Mac users, Premiere Elements 15 is also compatible with Mac computers, although certain features may not be available in the Mac version of the software. If you are looking for a video editor, which is not only available for both Windows and Mac, but also features the similar functionality to Premiere Elements and iMovie, you should try Wondershare Filmora. Watch the video below to get to know Filmora within few minutes.